Fabulous piece with quite deeply canted sides. the main figures in the scene appear to be collecting water, possible washerwomen. 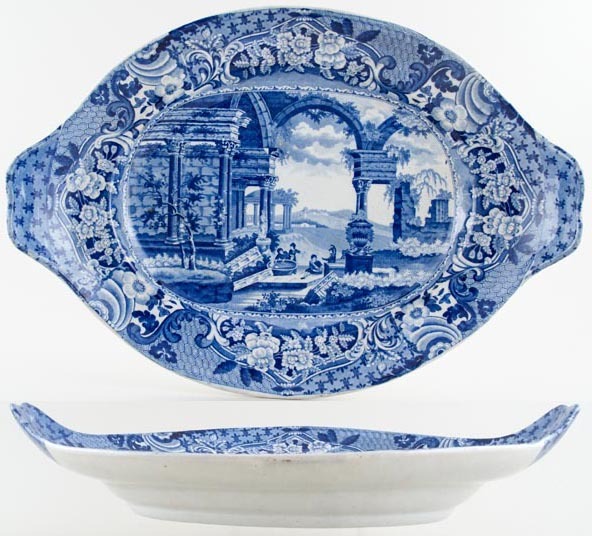 No backstamp, but examples of this pattern have been found marked Carey & Sons for John Carey & Sons of Lane Delph and Longton, active 1818-1828, after which the sons Thomas & John continued in partnership until 1842 and also found with blue printed octagonal frame containing the words Ancient Rome. Crazed with some associated discolouration and there is a tiny hole through the glaze in the sky to the right of the central arch. OVERSEAS SHIPPING OUTSIDE EUROPE Owing to the size of this item a supplement of � about US$61 will be added to the standard overseas shipping charge.